Breast milk is a storehouse of useful substances. There is nothing better for the baby than the milk of the mother. Babies, who are breastfed, tend to develop faster, gain weight better, and are more active. However, not all women have enough milk, some quickly disappear. In this case, it is necessary to transfer the newborn to artificial feeding. Manufacturers of baby food try to make mixtures for artificial feeding balanced and full. However, substitutes can not be compared with breast milk anyway. Children with artificial feeding needBefore giving the lure, so that they receive the missing vitamins and trace elements from the food. 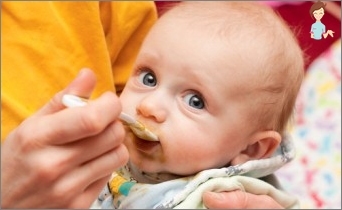 Begin to give the child new food is recommended at the age of approximately 4,5-5 months. More precise terms are better discussed with the pediatrician. It is best to introduce new food into day feeding, for example, at 10 o'clock, so it will be easier to track the reaction of the baby to the product and make sure that the chair is normal. In which order do you enter the products? The first thing that the baby is trying after breast milkOr the mixture is fruit juice or compote. This is not considered a lure. However, after juice, you can only enter another product after two weeks. As the first new meal, it is recommended to give the baby a vegetable puree. It is best to cook broccoli puree, pumpkin,Zucchini, cauliflower, green peas. Vegetable puree is rich in cellulose, vitamins, microelements, pectins, which are very useful for the forming organism. To introduce complementary feeding with artificial feedingYou need to be careful, because the baby can develop an allergy to a product. In this case, you should immediately stop taking this product and go to the pediatrician. You can also start lure with cereals: Buckwheat, rice or corn. It is believed that children with a liquid stool will be more useful porridge, and children with constipation is better to eat vegetable purees. The second type of products should be introduced one month after the first. When the child turns 8 months old, you can start giving him manna and oatmeal. At first, it is necessary that the child eat one or twoTeaspoons kashki, gradually it is necessary to increase a portion up to 150 grams a day. You can add a porridge of a teaspoon of vegetable or melted butter. After the porridge, the baby should be offered fruit puree. Milk is a very allergenic product, itsDo not recommend giving babies as complementary foods for up to a year. Kashi is better to buy special for kids, because in them the milk is processed and should not cause allergies. After five to six months, the baby can add a little cottage cheese. Curd contains proteins, essential amino acids, salts of phosphorus and calcium, which are necessary for normal growth and development of the child. Start giving cottage cheese with a teaspoon, toYear the child can eat 50 grams of cottage cheese. Do not give the baby more of this product, as proteins and salts can have a negative impact on the kidneys. In 6-7 months, artificial feeding involves the introduction as complementary foods of the egg yolk, hard-boiled. It must be thoroughly rubbed and added to a small amount of the mixture. First, a small piece of yolk will suffice,Literally at the tip of a teaspoon, then you should increase the amount to half a yolk per day. It is recommended to give the yolk twice a week. Over time, it can be added not in the mixture, but in porridge or vegetable purée. According to the supplementary table with artificialIt is recommended to give the baby meat at 7 months of age. If a child has intolerance to milk protein, then veal and beef is best not to give it to him. Instead, it is worthwhile to feed the baby with chicken, lean pork, turkey or rabbit meat. If the child has anemia, meat puree canAppoint and earlier in 5 months. After 8-9 months, the baby can eat meatballs, closer to one-year-old - chopped steamed. Also, from 8-8.5 months instead of meat once or twice a week the baby can be fed with white fish (hake, sea bass). In order to stimulate the child's chewing skills, in 7 months you should give him a rusk with juice or a piece of apple. For those mothers who find it difficult to remember in which order and at what time to introduce products, there is a complementary table. When the baby begins to eat new types of foods,His gastrointestinal tract adapts to them. During adaptation, there may be a discoloration of the color and consistency of the stool. Just as the newborn's chair changed from greenish-black in the first days of life to yellow or yellow-brown after artificial feeding, so the baby's chair changes with the introduction of complementary foods. It can become lighter, foamy, with slicesUndigested vegetables, with mucus. A child can walk more often. His chair will harden and darken with time. This is due to the fact that with the beginning of the use of new products in the intestine new bacteria appear and multiply. In any case, the chair should be carefullyFollow, according to his condition, you can determine whether the product approached the child or not. If the stool has too unpleasant smell, its color is completely different from what the food was, consult a pediatrician. If the product, which the baby ate before, was almost not digested, then it does not need to be given to the child. His body is not yet ready to digest such food. When introducing a lure, follow the reaction of the child and in case it is negative - remove the product from the diet. Health to you and your baby!